Jennifer Mezey is a Supervising Attorney in the Public Benefits Unit. Jennifer manages the unit and advocates for individual clients and systemic change in a variety of public benefits programs including Temporary Assistance for Needy Families (TANF), Medicaid, Medicare, DC Health Care Alliance, Supplemental Nutritional Assistance Program (SNAP) and Social Security benefits. 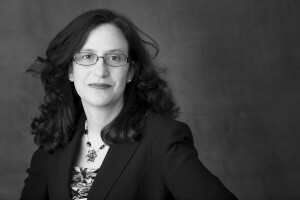 Prior to joining Legal Aid in June 2004, Jennifer was a NAPIL Equal Justice Fellow (and Counsel) at the National Women’s Law Center where she advocated for individuals and systemic reform of federal and District of Columbia child support and TANF programs. (She also was Senior Counsel at the National Women’s Law Center from April through August 2011 where she focused on federal Medicaid and health care reform implementation policies.). After leaving the National Women’s Law Center in May 2001, she worked as a staff attorney (and senior staff attorney) at the Center for Law and Social Policy on federal and state child care and TANF policy advocacy and analysis. Jennifer graduated with a B.A. in Government (with high honors) and English, and a minor in History, from Oberlin College in 1991 and a M.P.P. from the Kennedy School of Government at Harvard University in 1993. She received her J.D. from the University of Michigan Law School in 1998, where she was a Clarence Darrow Scholar. While at Michigan, she was an Articles Editor for the University of Michigan Journal of Law Reform and a student attorney in the University of Michigan Poverty Law Clinic. Before law school, Jennifer worked for the U.S. Department of Health and Human Services as a Presidential Management Intern, participating in the development of the Clinton Administration’s welfare reform initiative. In February 2015, Jennifer was named a Where Health Meets Justice (WHMJ) Fellow in recognition of her work to develop medical-legal partnerships between Legal Aid and various medical providers in the District of Columbia. The WHMJ fellowship program was created by the National Legal Aid and Defender Association and the National Center for Medical-Legal Partnership at the George Washington University School of Public Health and Health Services and funded by the Public Welfare Foundation to create the necessary leadership in the civil legal aid community to build successful medical-legal partnerships. In October 2015, Jennifer was awarded the Champion of Change award by the DC Primary Care Association in recognition of her work, focus and commitment to service and support of improving the health care delivery system for all residents in the District.